The 2020 Easter Jeep Safari is April 4 - 12, 2020! To register for an event - go to the EVENT tab, look for the Safari registration grid, click on it and follow directions. In preparation for upcoming events, you will need to create a profile on the website, and and add a vehicle to your profile before you will be able to register for an event & trails. PLEASE keep your license number and vehicle descriptions as well as your personal information up to date as time passes. This allows us to send you updates and information as it becomes available. You can PreRegister your profile and vehicle here, however this DOES NOT register you for an event. To register for an event, make note of the opening date on the HOME page and register through the Events tab. Questions - please check the FAQ's, your question may already be answered. E-mail us using CONTACT. Or call 435-259-ROCK. In 2018 we introduced a "Skills Day", led and designed by Nena Barlow, and in 2019 we will offer three Skills Days. All three days will be utilizing a portion of the Tip Toe Behind The Rocks trail. Two Skills Days will include spotting & recovery techniques and a third day will introduce winching and Hi-lift jack usage. All trails are available for review on the trails page. Check out the new RR4W Logo items in our store (Shop tab)! We chose items that might come in handy when you're out 4 wheeling, at the ball park or in front of the TV on game day. Coffee mugs, blankets, hoodies, travel mugs, and from the past - dash plaques, MUD pins etc. The Red Rock 4 Wheelers have a regular club run, usually scheduled for the 3rd Saturday of the month. Please note: the state of Utah has tightened up enforcement of non-licensed vehicles on public roadways. Be advised you may be pulled over and warned or ticketed. 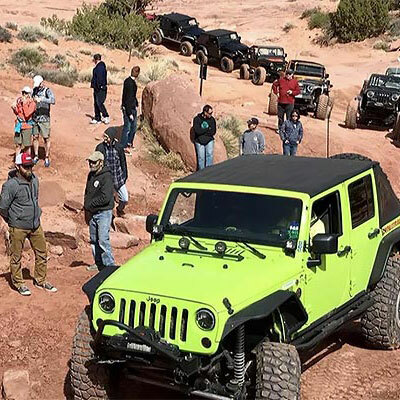 The Jeep Safari was Started in 1967 by the Moab Chamber of Commerce. The very 1st trail was "Behind the Rocks Trail" (according to what has been told to the club President, the road was made or improved with a BLM employee and equipment.) The "Moab Rim" was then added the next year. In those days, individual ice cream packages were dropped by airplane to the trails at lunch. All the leaders were Chamber members, there was no charge or entry fee, and only a Saturday trail. To register you showed up Saturday morning and signed up for the trail you wanted. The Safari was run this way through 1982 at which point the BLM required a permit and insurance. The chamber was no longer able to run the safari and approached the club to run this event. The Jeep Safari itself, and participation in the event has grown since the club officially formed in the early 80s. Once the event was coordinated by the Red Rock 4-Wheelers, the registration moved from the Chamber building north of town, to Lion's Park, and on to what was called "the Barn" which is where McStiff's is currently located near Center and Main. Over the years the increase in participation grew to expand the trail riding to more days until it finally reached a nine day event. "Big Saturday" still remains the culmination of the event on the Saturday of Easter weekend. With the increase in numbers, the registration was moved to the Spanish Trail Arena where it is located today several miles south of the city of Moab on highway 191. This also became the location for the gigantic raffle, Boy Scout BBQ dinner, and the major vendor exposition.